Hello and welcome to this week’s episode of Ukraine Calling. I’m Tanya Bednarczyk for Hromadske Radio in Kyiv and we’re bringing you our feature interview, followed by some new music from Ukraine. 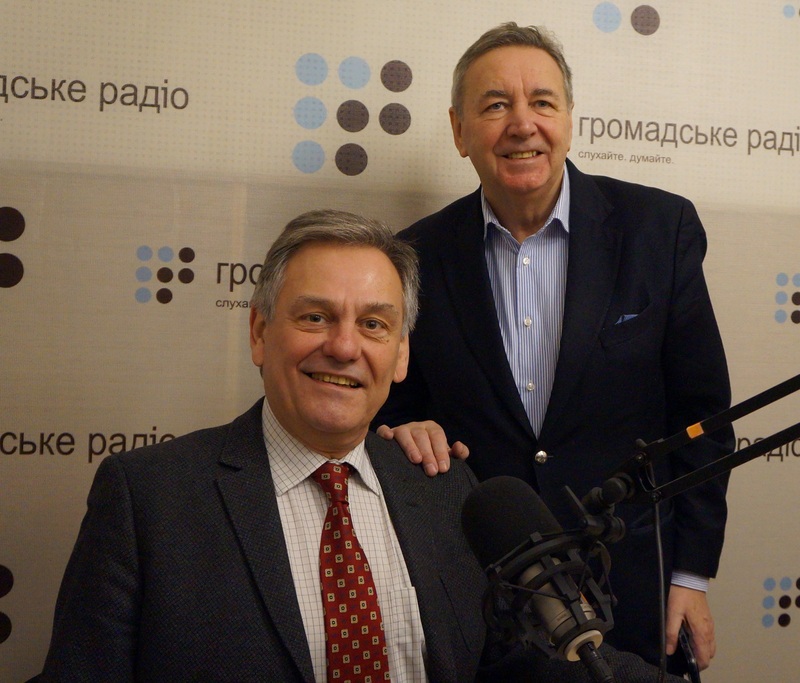 In this episode Bohdan Nahaylo talks to Alfred Praus, the President of the Ukrainian-Austrian Association, and they highlight the old and multifacted links between the two countries. Nahaylo: We do not often talk about Austria on Ukraine Calling. We have lots of visitors from the US, Canada, and the UK. I am delighted today we have somebody eminently qualified to talk about Austrian-Ukrainian relations and this is Alfred Praus, President of the Ukrainian-Austrian Association. Welcome, Alfred! Praus: Thank you very much. I am pleased to get invited. What would you like me to tell you? Nahaylo: We want you to tell us the maximum in the short time available. Let me begin by saying that Ukraine and Austria had been connecting for centuries mainly because of the Austro-Hungarian Empire and Austria’s rule in what is now Western Ukraine, former Eastern Galicia. But I would also like to remind our listeners that Austria was in fact one of the four major powers, certainly two major powers –Germany and Austria – who at the Treaty of Brest-Litovsk, exactly 100 years ago, was the first to recognize Ukraine’s independence. We remember and are grateful for that, and for Emperor Franz Josef and good rule in Eastern Galicia. Praus: In this respect you might be even better than me in history. I am mainly knowledgeable about monarchic connections because during my first years of work in Ukraine I was many times in Western Ukraine, the former part of the Austrian-Hungarian monarchy, in Chernivtsi, Ivano-Frankivsk, Lviv and the Zakarpattia regions, where I was doing business. So I am well aware that this was one of the thriving times of this part of Ukraine. Nahaylo: That is a special study in itself. If we were to talk about the fate of the Habsburgs, and one of them in particular, Archduke Wilhelm von Habsburg, who was with Ukrainian Sichovi Striltsi and was kidnapped and killed by the Soviet communists eventually. A book was written about him – Vasyl Vyshyvany, as he is known in Ukrainian [The Red Prince by Timothy Snyder, 2008]. But that’s another story. Before we launch into our discussion I want to emphasize that Ukrainian-Austrian relations are built not just on history and culture, but today increasingly also on economic ties. To put things in perspective I would like to remind our listeners that a week ago the President of Austria visited Ukraine, and it was a very successful visit. But first, Alfred, tell us a bit about yourself? How did you end up in Ukraine? How did you become President of the Ukrainian–Austrian Association? Praus: I have been in international industry, in international engineering for more than 25, almost 30 years, successfully restructuring international groups with world-wide and Austrian based business. I came to Ukraine by chance because a friend who is a very successful Eastern European entrepreneur asked me to help. I took a sabbatical at my last industrial job in Western Europe. I was successful at turning around some companies. He asked me to assist him in building up some business, so this how I came here just when Orange Revolution was taking place in October-November 2004. Nahaylo: So you have been here for a while and you’ve seen quite a lot of change, ups and downs. Praus: Yes. In the first years I was shuttling between Austria and Ukraine. As it happens many times, I got “stuck” in Ukraine because in 2006 I met my wife here. Nahaylo: A famous opera singer, a soloist at Kyiv National Opera. Praus: Yes. Susanna Chakhoyan. I am happy I met her. It was a real game-changer because normally as an expatriate, a foreigner, you do not easily meet such people. Nahaylo: So you integrated not only into business and economic life, but also into cultural and social life. Praus: Yes, and because of this I am not “normal expatriate”. I am kind of a peculiar, or special, expatriate, and I am glad about it. Nahaylo: Let’s focus on the work of the Ukrainian–Austrian Association. Give us an idea of size and scope of this entity. Praus: Originally I planned to go back to Western Europe but when the crises broke out in 2008-2009, and then Yanukovych came, there was not much of international business or international investment, not much trust by Western Europe concerning Ukraine. It was for family reasons that I stayed. A little bit more than a year ago I was so frustrated by the lack of real business and by the lack of interest concerning bilateral business between Ukraine and Austria that I decided to establish a platform to work from. That was the reason why I established Ukrainian-Austrian Association. I am using it as a vehicle, as a platform, for initiatives in cultural, civil, social life and, of course, also business. Nahaylo: You’ve obviously been helped by the EU’s Association Treaty with Ukraine, the free visa regime, etc. That has probably made the operating environment more conducive. Praus: This certainly contributed to the reasons why I established the Ukrainian-Austrian Association, yes. It’s a private initiative, I have to stress that, because I was treated in the past month like someone highly official. There was obviously a real niche – a vacuum, for an entity like the Ukrainian-Austrian Association. It was well received. Nahaylo: So we can say that you are an official ambassador here. We have the state to state relations, and you are the unofficial ambassador who’s been here for many years, and supports the work of the ambassador? Praus: I would not say that, but if you say so, I would not disagree. Nahaylo: Of course, we have to be diplomatically correct and follow protocol. I notice from the Ukrainian Business Journal’s publication that Ukraine’s exports to Austria rose by 48% last year. This is what President Poroshenko announced a week or so ago at the joint press conference with your Austrian President, Alexander Van der Bellen, and that overall bilateral trade was up 18.5% to $1.2 billion. That’s not bad! Praus: This is quite good for such a tiny country as Austria is in Europe, because we are basically one tenth [in size] as compared to Germany. But Austria has been, as you mentioned, quite an important investor in Ukraine from the very start. Nahaylo: Can you give us a few examples of the most recent areas of investment? What is of particular interest to Austrian investors? Praus: Bank Aval, belonging to the Raiffeisen sector, is currently the most important, and by far the biggest, foreign bank in Ukraine. If you go to the insurance business, there are two very big international Austrian groups, like Uniqua and Vienna Insurance Group – they are market leaders in Ukraine. We also have a lot of industrial investments. In Kyiv oblast, in Zhytomyr, in Kherson, and of course in Western Ukraine – the former monarchy, etc. Austria I think is number five or six in terms of foreign investors in Ukraine. But this may not even be the true picture, because there’s Cyprus, and with Cyprus, you never know where the money comes from: I know some Austrian businesses who do their investment through Cyprus. Nahaylo: From my notes I see that in Lviv oblast 15% of all foreign investment last year came from Austria, compared to say, the next-door neighbor Poland which spent $16 million. And I note that Austria is 8 hours by road, by motorway, and it’s a 90 minute flight to Vienna, and that you have Austrian Airlines flying to Lviv. Do you think that one day we will see Austrian coming to Kyiv as well? Praus: Of course. Austrian Airlines is flying, some days even twice a day, to Kyiv. It’s flying to Odesa, and as I recall, to Kharkiv as well. And of course Lviv. Nahaylo: Impressive. And I see that there are new projects: packing for Coca-Cola, and a sawmill project in the Carpathians, where there’s a potential for hundreds of millions of euros. Doing it in an ecologically clean and controlled way, not just massacring the trees. Praus: This makes a difference. Nahaylo: Well Austrians are known for propriety, for doing things properly. And there’s a new Honorary Consulate in Lviv, that’s just moved to new premises, and a new person has taken over? Praus: That’s Markian Malsky. He’s a lawyer, a good friend of mine. And he has a very prominent father, a top guy at the university level. I think this was a very good move. Nahaylo: Do you see momentum now in the development of bilateral economic relations? Praus: I do see that, although I’m not as optimistic as some other people are from Germany. Even Austrian TV was reporting that relations are booming. It’s certainly not a boom. Western Europe is still quite hesitant. There is much more interest now, but there are a lot of factors, a lot of issues, which are still preventing the big boom. And let me tell you about one thing I am always aware of, and always telling people, that is, compare the investment attitudes of Western Europe to that of China. If Western Europe does not wake up a little bit, China will be the biggest investor, much bigger than even the European Association in total. Because China is acting, and Western Europe is thinking and considering. This makes a difference. Nahaylo: On another scale, not as large as China, we have Turkey also interested. Nahaylo: OK, in a nutshell, if things were to improve in the business environment, corruption curbed, etc., what else could Austria offer at this stage to Ukraine, not just in terms of investments – know-how, links, to help this country integrate into Europe? Praus: Austria is a prime country concerning tourism. At present I have a project to maybe involve Vienna’s world famous Modul University to start collaboration, a joint venture in Ukraine. This is just an idea, we are at the first stage of it, so it’s not official, so it’s just to mention that there are some moves, some considerations, in this respect. So, tourism, for example. Apart from that, Austria is a small country, but it has some really important, hidden champions. For example there is the AT&S company, they are one of the world market leaders [a anufacturer of high-value printed circuit boards and IC substrates], with operations in China, etc. There could be know-how. The industrial sector. Another hidden champion is nutrition, food engineering. Austria has, let’s call it a ‘delicacy business, high level gastronomic products, in many cases organic ones. Truly organic products. So, there can be a lot of know-how in the food industry that could be brought from Austria to Ukraine. These are just a few examples. Nahaylo: This is very inspiring, and of great interest. Now, in terms of cultural relations. Clearly, we see the impact of the Austrian heritage in Western Ukraine, in particular in the big cities. It’s not just the Poles who played a role there but under the, let’s say leadership and supervision of Austria, in it’s heyday, in the 19th century, much progress was made. In literature, we know of Leopold Sacher Masoch, as a writer. His father was a police chief in Lemberg, as Lviv was called in those days. Nahaylo: And I believe that your father is also from somewhere in that region. Praus: My father was born in Chernivtsi in 1919, because my grandfather was a high-ranking police officer during the Austro-Hungarian monarchy, and he only returned to Austria a year after the end of the First World War. Sometimes I even show the passport of my father, born in Chernivtsi. I think it was part of the Kingdom of Romania in 1919. Nahaylo: One feels that, particularly in the west of Ukraine, in what was called Eastern Galicia, there was a nostalgia in the older generation for “the good old days of the Austro-Hungarian Empire”. We used to hear stories in the 60s and 70s that people still had portraits of Emperor Franz Joseph in their homes. Praus: You still see it! You go to some country inns in Lviv Oblast, and go to the backroom and there is a big portrait of Franz Joseph. I’ve seen it myself one year ago! Nahaylo: But in Austria, is there an appreciation that this part of Europe once was linked so closely to Vienna and to Austria? Praus: Yes, but maybe a little bit less, to be very honest, than it is in Western Ukraine. This is partly due to…well, I’ll put it in a different way: when Otto von Habsburg [the son of the last Austro-Hungarian monarch] was still alive (I think he died in 2008 or 2009 at the age of 97 or 98), when he was still active — he had an honorary doctorate from Chernivtsi University, and I think Lviv University –. he did a lot for Ukraine. This has been a lost a bit because his son Karl von Habsburg, who is a friend of mine, I know him quite well, is not that active with regard to Ukraine because he does not have the historic roots as much as his father had back to the Second World War. So the affinity within the territory with the monarchy may be even a bit stronger in Western Ukraine as compared with the awareness in Austria. Nahaylo: And your project—your Ukrainian-Austrian association—on the cultural front, what sort of things have you been involved in? Praus: You have mentioned that I’m married to a cultural star, Susanna Chakhoian: she performs in French and Italian, and she’s also good in German, with Mozart operas. She’s probably best in them because she’s fluent in German. Nahaylo: Ah! We forgot about Mozart and the Mozart festivals that have started up in Ukraine. Praus: Yes, and Oksana Lyniv, the renowned conductor, is a friend of Suzanna’s. Suzanna will be performing the soprano role in the Mozart Requiem on 16 July in Lviv. Nahaylo: Fantastic! And Lviv is where Mozart’s son ended up, or at least spent a lot of time in. People don’t know this. Nahaylo: Okay look, I’m sorry we’ve run out of time. 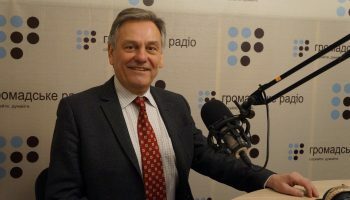 My traditional question is: looking forward, what message would you like to share in a sentence or two with our listeners about Ukraine, about the Austro-Ukrainian connection, or convey your own sentiments concerning relations with this country. Praus: Concerning foreign affairs? Not only about business? Nahaylo: A general message, even just to our listeners in Ukraine, to the younger generation. Praus: Forget about corruption, because corruption will be prevented hopefully, finally, by the government, by the official Ukrainians so-to-say. There are so many areas in Ukraine where there is not so much corruption, so don’t be blinded and say “Ukraine is corrupt” and “this is no good”. No! The people here are hospitable, friendly, and the country is beautiful. There is a rich cultural heritage, a joint heritage with Europe, not only with Austria, but also Poland, Hungary, etc. Come to Ukraine! Many people are trustworthy, not everybody is corrupt. Take this country as it is, and it might be a very good decision and you might not be disappointed. I like to be here, and I think that you should help and assist and contribute to the development of the potential of Ukraine, which is huge. Nahaylo: Okay, so, in short, don’t miss the Ukrainian wood because of the tree called corruption that threatens to block or impair your vision, and see the broader picture. Thank you for this inspiring note on which we finish. I’ve been talking to Alfred Praus, the President of the Ukraine-Austrian Association. Thank you very much, Alfred, for joining us. Praus: Thank you very much. It was really a pleasure. A Kyiv band called Шосте Чуття, which means Sixth Sense, just released a new song. It’s a love song, sad, but with a happy ending. They titled it “Я Без Тебе.” It can be translated as, “Without You.” Enjoy! Next week we’ll be back with more commentary on events in Ukraine. Andriy Kulikov will talk with military experts about regulating conflict, so tune in again for another edition of Ukraine Calling. We would be happy to receive any feedback from you. Write to us at: [email protected] This is Tanya Bednarczyk in Kyiv. Thanks so much for listening.